Although this is our 3rd child this is the first time that I have run while pregnant. When I first found out I was pregnant I searched the web for “Pregnancy running gear”, “Pregnancy running clothes”, followed by “Cheap maternity running clothing”, “Pregnancy running tips”, etc.. I wanted to find out what I could to set myself up for success. As helpful as the information was each pregnancy is different and I soon realized that I would be learning as I went. 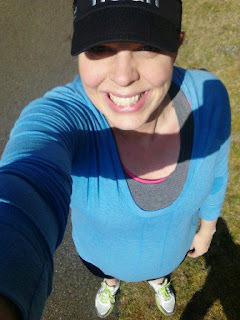 I am 28 weeks along in the start of 3rd trimester and I ran 4 HILLY miles yesterday. This is SUCCESS in my mind. I am not comparing myself to anyone. I am celebrating each day that I am able to train in the sport I love. Along the way I have come across what I am calling Pregnancy Must-Haves. This is my short list; if something on it helps you while running pregnant it was worth posting. Moving Comfort has SAVED me. Having never been a big girl in the upper region I did not know what to do with my new assets. Moving comfort had the solutions. 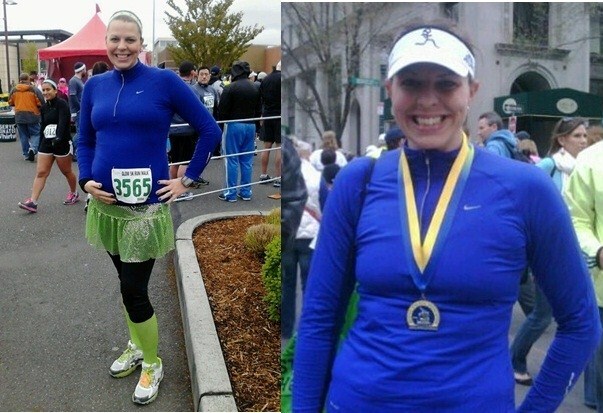 I wear my Juno and Fiona bras for all my runs, so much better than doubling up on constricting sports bras. The hooks in the back make the bras much easier to get in and out of as the bump grows. And they have SALES online HERE . 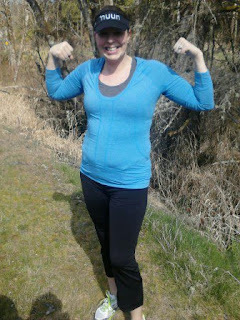 I know many women are resistant to convert to maternity pants, if you can fit in your regular workout gear more power to you. I have not been that lucky. I also do not have the budget for high priced gear. I was lucky to find pants I love at Old Navy and Motherhood Maternity. I think 2-3 pairs is enough, but I am only running about 2-3 times weekly. Tugging to keep a top down is the WORST! Thankfully the styles right now seem to be headed toward longer lengths. I have had success going up a size at TJMaxx, Ross, Marshalls, and the like. Clearance racks are great. My worst fear is ruining my favorite tops because I try to stretch myself into them. 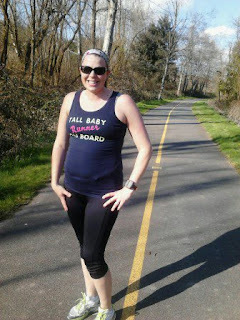 I am in love with my t-shirt from Run Like a Mother BUY HERE, the top that my buddy Zoe made for me and the decals sent by my friend Mandy to add to a clearance top I found. It is FUN to wear something that lets the world know you are bumping. "This is not a speed bump, and I am not slowing down." I bought mine at a consignment shop for $12, since it does not go directly on my skin I was not worried about second hand. I highly recommend scoping out local consignment shops and sales for items like this to save some $$. 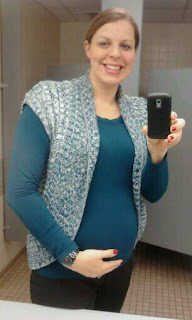 The style I got was similar to the Motherhood Maternity style. I don’t wear the top strap. What I LOVE it the back-support, the breathable fabric on the back and the easily adjustable waist. 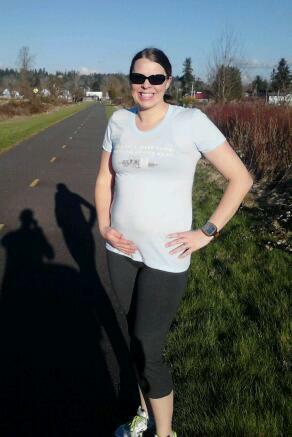 I don’t love how it makes mid-run bump photos look, but I feel like the extra support has kept baby girl off my bladder. Also the belt keeps my under tank top down and pants up, double bonus!! As you get slower you may feel like you are holding back your partner. DON’T! That person agreed to run with you and is there for YOU! Having someone there is important (especially as you enter 3rd trimester), don’t feel guilty, enjoy the company it will keep you from solely-focusing on your ever-present bundle of joy bouncing on your front-side (and your bladder). I slow him down and he supports me.... TRUE LOVE!! Pregnancy is not the time to test new shoes. If you have a brand/style that is your old faithful keep with it. I love my Brooks Adrenalines, I have not even thought about putting on any minimal support shoes since I have been pregnant. My feet are flattening and widening as the weight increases making supportive shoes all the more crucial. 1. Take credit for every movement. I run, jog, walk, etc. I keep my Garmin on and record the final mileage and finish time regardless because I am proud of what I have done!! 2. Pace does not matter. As a competitive person I find myself fixating on my Garmin at time, willing it to move back to a lower pace….but now is not the time for that. No one cares how fast I am running. 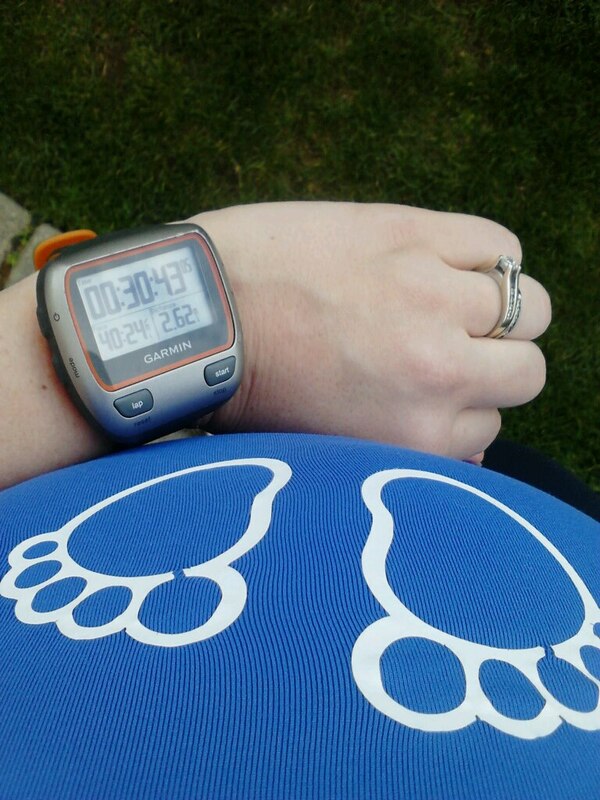 I am running for myself and my baby not to set any speed goals. 3. Set yourself a goal of time/distance/etc. going in, but be prepared to through that goal out if your body does not respond. This is NOT the time to push through the pain. 4. Give yourself a BREAK. If there is anything I have learned while running during pregnancy it is that my body is very fickle. I can set out with the best of intentions and quickly realize that it is not going to work that day. Running 2 days in a row does not work for me and that is OK. There will be days I think I am DONE running, then follow it up with an amazing 5 miler a couple days later. 6. Drink water, then more water, and more water. This will help with cramping and keep you moving on your runs. I will drop in a Nuun tab every once in a while for some added electrolytes. 7. Start and end your runs at a bathroom and use it before and after. The unpredictability of internal NEEDS has been a tough adjustment for me. When nature calls I want to know how far I am from the nearest facility (or bush if in dire need). 8. 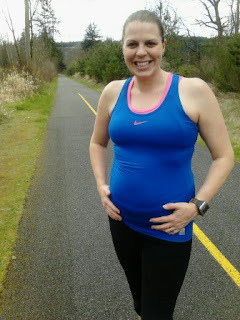 Take photos of your pregnant running. I have really enjoyed looking back at my mid-run bump shots. Maybe it is vain, I do love having my photo taken, but I think of it as an addition to my pregnant running journal. 9. Keep a record of your workouts. I love using DailyMile (find me HERE) it helps me keep track of walking, hiking, running, etc. and is also a very supportive community. 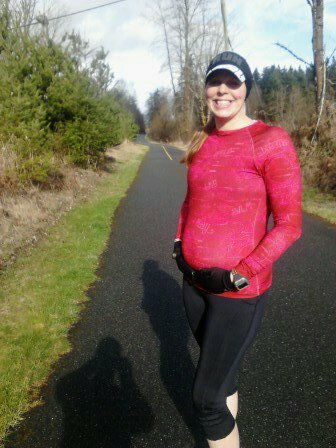 The comments that people leave on my runs make me smile and remind me that what I am doing is “inspiring.” I also have a simple week by week spreadsheet for the 40 weeks of my pregnancy where I record my mileage and little notes about the week. 10. Take care of yourself and your little one! That is the most important tip I can give you. I am sure there are plenty of things I have missed. So drop additional tips in the comments. Sending Positive Vibes your way!! Pregnancy update and more photos coming soon!! This week has been tough for the running community and the world. I am blessed to have a friend in Boston who I could connect with and focus my love toward.. This week my runs were dedicated to all those impacted by the tragedy. 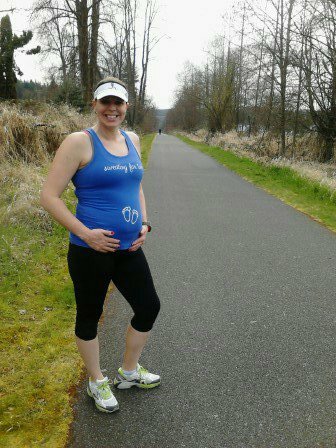 2.62 miles run at 26.2 weeks pregnant.. 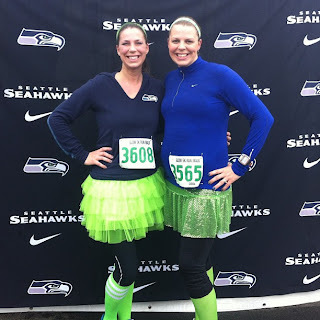 When I picked out my outfit for the SeaHawks Glow 5K I did not have too many options, imagine my surprise when the Nike top I wore after I finished Boston in 2011 fit and covered my ample 27 week bump.. I wore my Boston 26.2 necklace under the top and spent most of the run people watching and relishing being a part of such an amazing community.. 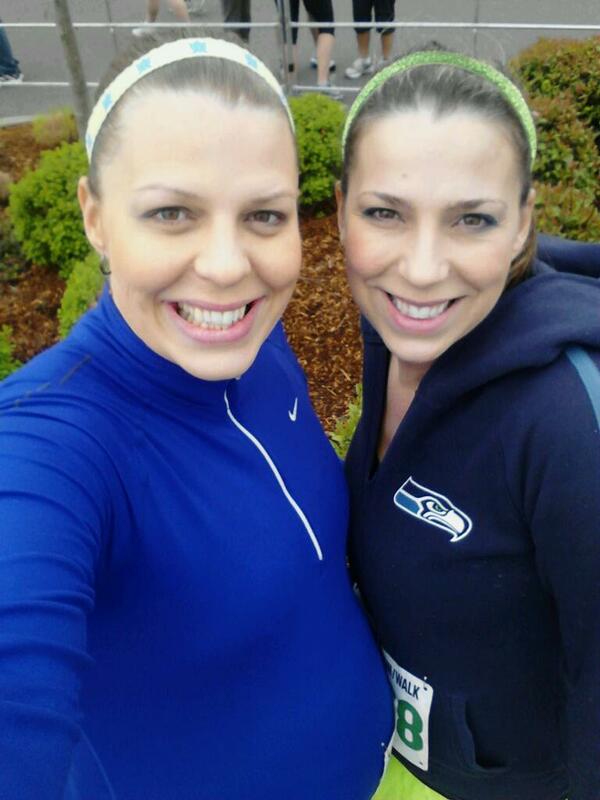 The BONUS was running the 5K with Tall Sister. 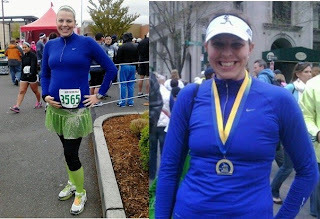 We were supposed to run the St. Paddys 5K together in March but I came down with a horrible cold. 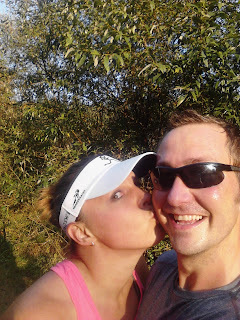 Today we chatted through the whole race and had a great time... I counted 5 dogs, 4 jogging strollers and a handful of tiny boys smaller than LS #1 passing us.. 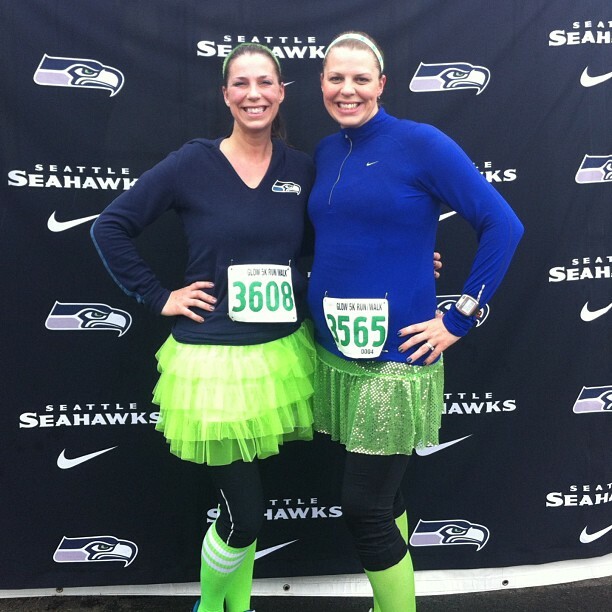 I was not worried about pace...this race was to be with my sister, get a workout and have fun. We Finished at 33:31 which is about 10:40 pace which we were both happy with!! Before the race, baby Q even made the photo.. It rained a bit but I felt comfortable.. After the race I felt my little lady jumping on my bladder so we took a pit stop, went to get coffee to warm up, then went shopping for a bit in nearby stores. I really liked the location and the overall logistics of the race.. and the course was FLAT which was great! After the race.. It rained a little and we were getting chilly.. 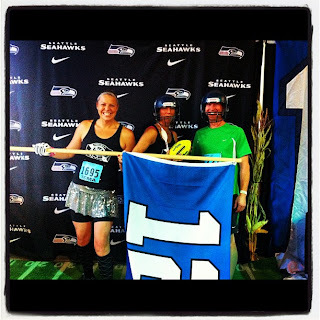 Funny the last time Tall Sister and I ran a 5K race we ended up posing in front of the same backdrop.. Hoping I can get this shape back by next Fall. To follow with my Tall Baby growth journal I will be 27 weeks tomorrow. Cravings: Waffles with whipped cream and berries, Ice Cream and tater tots....not great for weight gain. Really trying to keep my diet in check but the HUNGER is extreme. I eat a lot of fruits, veggies, nuts, grains, etc. to keep me satisfied. Running: I ran 3 times this week and felt GREAT!! My support belt has been a great help and keeping the distance low makes for easier recovery. I am still around 10:15-10:45 pace, although I don't obsess if I need to walk. Sleep: Overall sleep is good, I am cherishing it as I know what having a newborn can bring. I could do without the creepy and vivid dreams which are a result of interrupted sleep. The fatigue throughout the day is very draining wishing that corporate America would bring back the nap. Purchases: Dresser, paint (pink and white), chair rail and supplies to transform her room, hot pink converse from a consignment store...and more..
Growth: The BUMP is fully sprouted. 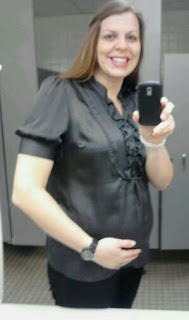 Hoped that I would be smaller this pregnancy but with the rapid growth I am doubtful. I went through my clothes and arranged so that I only have to look at items that fit me. I still have an inny belly button and have no swelling. Baby Movements: This little lady likes to do her pilates!! She is very active after meals and at bedtime. Really cherishing this time...while a bit nervous how these movements will feel when she is bigger. That is about all I have for now.. Wishing you all clear pavement and loads of energy!! The horrific events at the Boston Marathon today leave me sad, heartbroken and in fear. 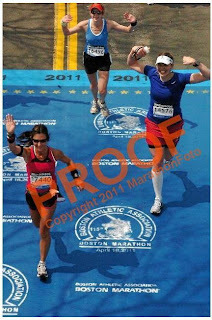 I cant help but put myself in the position of the runners, the spectators, and everyone in the city. I will never understand evil!! Why do people chose to take something so special away?? 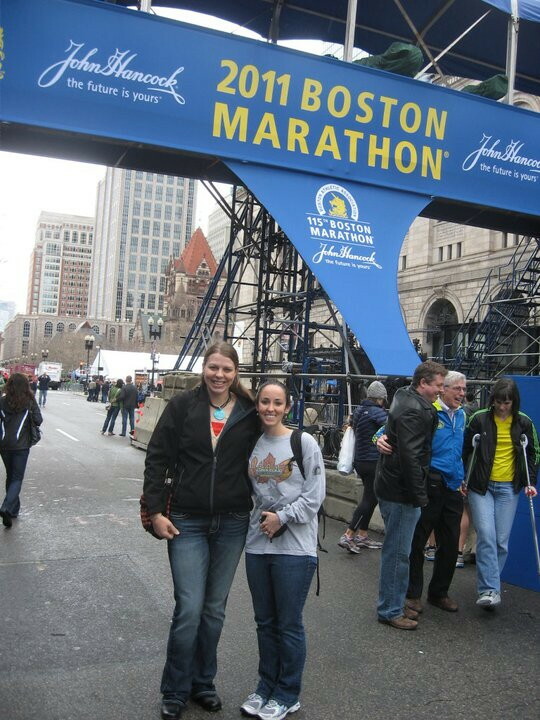 For so many their Boston Marathon experience today was not what it should be, marred by fear, injury and death. The tragic event will live in the nightmares of my friends, fellow runners and all those who were there to support the Marathon. 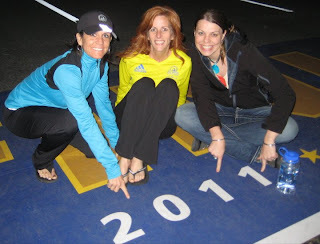 I ran the Boston Marathon in 2011 and although the day did not go as I planned, it was all that I could have imagined and more. I cant help but let myself focus on my moment and not take myself to that dark place of what happened today in the city that holds a special place in my heart.. 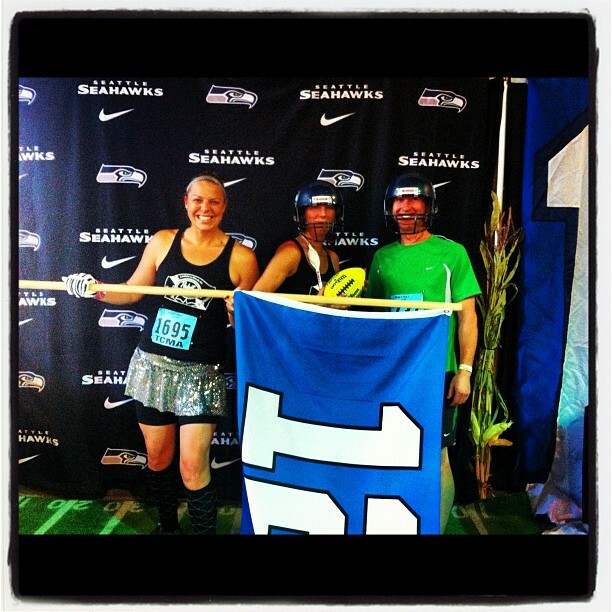 I sat on the Finish Line the night before the race with my training partners and friends. I flexed my muscles crossing the Line just over 4 hours. I earned my medal and joined the foil blanket fun that followed..
Maybe it is selfish to take my head and my heart there... but at the end of the day the Evil cannot take my moments away.. This was my Finish Line in Boston just 6 months after the unexpected death of my Dad. FINISH LINE!!! I was zombie, the pack of people was so tight.. What I do remember is the Medals, I picked a pretty young lady with a dimpled smile. She put the medal around my neck and I turned away. Tears flooded down my face and suddenly the world melted away....I could feel my Dad giving me a HUG, I could smell him, the crowd was gone and I was with my Dad... I felt him say "I am proud of you, and the family. Keep going, I am with you." People probably thought I was CRAZY!! I am not sure how long I stood there motionless, it felt so GOOD to feel his presence.. Suddenly he was gone and I was ALONE, in a sea of people but alone. 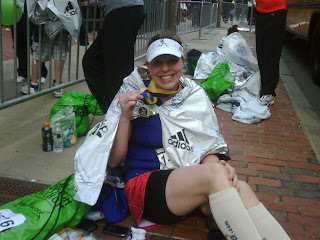 My friend Bethany Finished today in 3:41....an amazing time!! She was able to connect with her husband and they were together when the bombs went off. She should be celebrating with greasy food and a milkshake instead they departed to the safety of their home in Boston... She has so many GREAT Boston memories, I pray for her heart to heal in this tough time. If you have a positive Boston Moment please share....let yourself remember because we cannot let Evil take this away from us. I need to start labelling my photos from my phone so I can keep track of the bump growth :) It is getting harder and harder to tell one week from the next as baby is in a MEGA growth phase right now. Thankfully I have been posting on facebook to keep track of the weeks. I am still running (jogging) about 2 days a week and walking most other days. 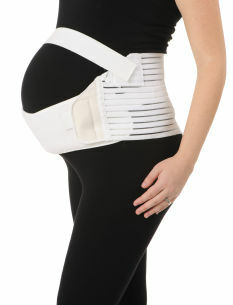 I have been wearing a support belt because baby girl likes to hang out low and the pressure is a bit much. My gripe right now with running is calf cramps and soreness in the muscle in my abdomen. I am getting some FUNNY looks at the trail these days which is fine by me. It is funny because some days I am much bigger than others, you will notice in my montage of photos below. 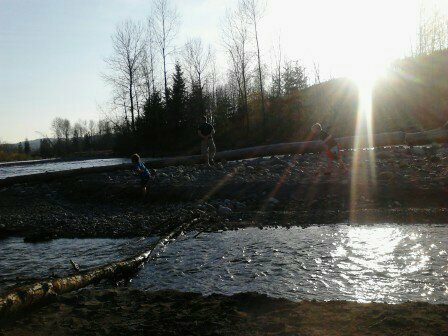 My phone camera is NOT the best, I want to get a new one before baby is born so her first years are not blurry..
Easter Weekend we had AMAZING weather and really took advantage of it with multiple egg hunts, family time and a trip to the river for the boys to adventure. I have struggled some with the pain of running, but I am determined to keep it up as long as I can. I pay attention to my body no need to push through any pain that will cause more harm than good. 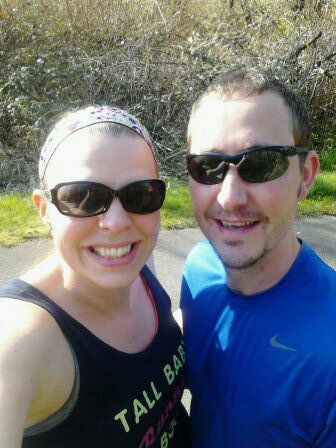 My running partner, love him!! Our 5K last night was AMAZING!! I had slight calf cramping but other than that I felt "normal". Special thanks to my good buddy Zoe for the tank top, it was a surprise in the mail last week!! I forgot I was wearing a tank with words and noticed a lot of people staring at my chest..hehehehe.. Muscle Man is now training for Seattle Rock N Roll which means that ours runs together will be add-ons to his training, yesterday he ran a fast 5 miler in the afternoon and a 5K with me that night.. 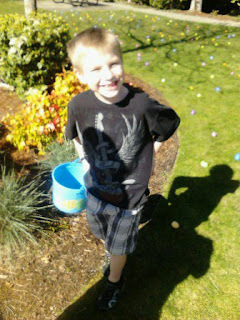 So proud of him!! As I get heavier my bad knee (old basketball injury) is starting to feel the strain. In non-prego life I have to keep right around 200lbs or less or the pain gets worse. I am at 222 right now with a gain of 17 pounds thus far. I am hoping I can stick to my goal of 25-30 but time will tell. 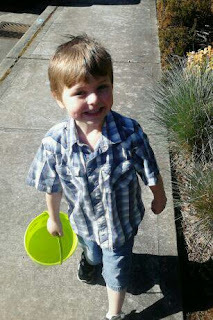 Current Aversion: Meat products, although the Easter Ham hit the spot. Baby Likes: March Madness!! She is super active when I watch basketball. She also really responds to music and loves to play when I am reading before bed. Baby Dislikes: I felt horrible when I was sick and coughing I could tell that it was not comfortable for her. So far peanut butter is the only thing that she really does not seem to like. Excitement: Feeling her move and seeing the boys talk to my belly. It is starting to get real for them and us as a family and that makes me very happy!! Gripes: Calf cramps!!! The endless hunger is NOT FUN when I am trying to keep my weight in check. Purchases:Found an awesome bassinet for $25 and have bought many items for her nursery. We still need to pain the walls and buy a dresser. That is all I have for now. Hope everyone is doing well. Be sure to check me out on Facebook HERE and Dailymile HERE as it is easier for me to keep those updated these days.